We’d love your help. Let us know what’s wrong with this preview of All In Good Time by Tara Kuczykowski. To ask other readers questions about All In Good Time, please sign up. If I read this ten years ago, I would be more appreciative. However, this time I felt annoyed, like, "This information has been circulating the internet forever." You know, since the internet has been around *forever*. It's good for an overwhelmed newbie; it's not good for an overwhelmed further-down-the-road-er. Lots of useful information but not so useful to me. I guess we know what we need and how much to stock. It didn't discuss yarn, fabric or books. BUT that's what I like to think about more than canned goods or toilet paper. There are little snippets of good info here, but it's heavy on the really basic tips ("Buy Christmas cards for next year right after Christmas"). Poorly organized, some advice was actually really wrong. What a great reference book for those who own a home and need a few more ways to save money around the house and even beyond the home. Going room by room was a perfect set up to allow for ease of reading and quick reference back when you are wanting to hunt down a particular tip. As a blogger, I loved that these women used their experiences online to help fill out the book with others opinions and suggestions. 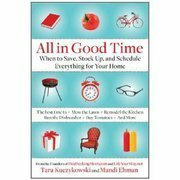 The one part that I may have glossed over were the parts about children - the chores i What a great reference book for those who own a home and need a few more ways to save money around the house and even beyond the home. Going room by room was a perfect set up to allow for ease of reading and quick reference back when you are wanting to hunt down a particular tip. As a blogger, I loved that these women used their experiences online to help fill out the book with others opinions and suggestions. The one part that I may have glossed over were the parts about children - the chores in the home, the ways to save money in regards to toys, clothes and so on. As me and the boy count our pup as the only child in the house, these great tips didn't quite hit close to home for us. But for those who have children in their home, this book would be perfect to keep on the shelf for pointers. A good reference list with handy tips along the way, but highly frustrating to discover that all of the links cited in the book as "allingoodtime(dot)net/_________" go to other websites rather than pages on their website. Even more frustrating, many of those links aren't direct permalinks, but go to blogs that you have to sign up for in order to look up said article. Amazing that a time management reference book would make retrieving sourced info so much of a time waster. On the plus side, the Ap A good reference list with handy tips along the way, but highly frustrating to discover that all of the links cited in the book as "allingoodtime(dot)net/_________" go to other websites rather than pages on their website. Even more frustrating, many of those links aren't direct permalinks, but go to blogs that you have to sign up for in order to look up said article. Amazing that a time management reference book would make retrieving sourced info so much of a time waster. This was an okay book. I'm not sure exactly what I expected to find in it. They authors packed a lot of information in this book and I liked that they included personal anecdotes in the different sections. I especially enjoyed their tongue in cheek top ten reasons why you shouldn't plan a weekly menu. This book has some good tips. I could see it being primarily beneficial to younger married women, or those with young families who are looking to better steward their finances. I found the section on moving really helpful in terms of organization. Yes, a lot of common sense, but it could be referenced from time to time. In my quest to be more organized at home I decided to pick up this new release at my library. I'm about halfway through this book and it's a mixed bag: there are some great tips that I've made note of and had not heard before but there's also a lot that I'm already aware of. Overall not too bad. All in all, a useful guide, but some of it seemed common sense to me. Also, way too many "sales ads" through pushing specific brands or tools. This would probably be a better occasional reference book than a read-through book. Good book to skim through. Lots of money saving ideas and tips to make managing your household easier. Some good nuggets of advice but overall lots of common sense and a couple things weren't correct. Still, glad I read it for those bits of advice I hadn't heard before. It had a lot of information but not really a good book to sit down and read cover to cover. Helpful book but mostly promoting their websites. I'm sure you could find most of the information online by a simple search. Being past forty, most information I knew. I do advise it for young families. It is a great place to start for young families and those just starting out on their own. This had a lot of information in it & I did get some good tips. However, it was SO unorganized, so I had a hard time following everything. Kind of confusing! Some good tips but a lot of it seemed like common knowledge to me. Random collection of tips, and not very well organized. Fine for blog posts, but not suitable for a book. I am not their target audience since I am a woman in her 50s. Good stuff though if you were just starting on your own or raising a young family. I did get some websites to look at. Some useful tips but not too much one hasn't figured out for oneself. Very random format. Informative. A good reference for planning at the beginning of each year. Picked this up at the library on an impulse. Not what I expected from the title and teasers on the cover. Didn't really find that much useful information in it. Not as in-depth as it could be, but some helpful tips. Quite a lot of reference to coupons, and really Ameri-centric. Made a few notes. Some good advice, but I found I knew most of the hints. Good if you know absolutely nothing.